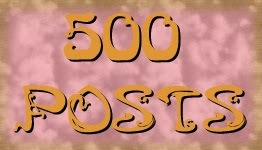 In a few days my 500th post on this blog will go live. I've noticed that the thing to do is to have a giveaway and do a retrospective. So first the giveaway. It will be a piece of art (no, not an icon!) that I have made. I had this idea (may even have blogged about it) which never came to fruition because that happens with ideas sometimes. But more detailed because I haven't say down to paint it yet. So if you would like to win it, just leave a comment, maybe about what your favorite post here has been, but it can also be a comment that says: "ooh! A giveaway!" Please be sure to leave an email I can contact you with, if you don't have a profile with an email address. After 12 midnight on Sunday 24th November, I'll pick the winner! This blog started when I migrated from livejournal and wanted to share pictures of whatever I was working on. I'd seen other craft blogs, especially the Where Women Create blog parties and wanted to be a part of it. Even after all this time, I still haven't managed to take good photos of my art and my beautiful room? Needs a serious clean out. I attempted to reboot my blog at the beginning of 2012 to form a community but perhaps I was unwilling to be vulnerable enough to let it all hang out there and so I blogged about faith, gratitude and my spiritual journey with side trips into art. Don't forget to sign up for the giveaway! Uh, oooops….the "ooh! A giveaway!" was me… Lory I just figure you have supernatural powers that will allow you to recognize my typing.